Wheat stubble to protect the soil. The management of residue following harvest is very important, be that wheat stubble or possible cover crops. The management will play an important role in the success of the crop that follows. 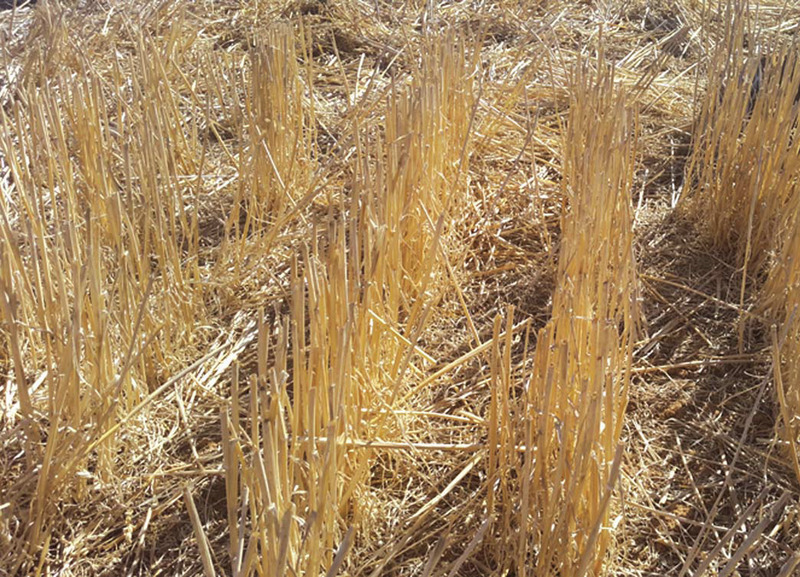 Conventional or conservation agriculture practices will have different ways of dealing with the wheat residue. In conventional farming practices residue is incorporated into the soil through different tillage practices before the next crop is produced. It is certainly the easiest way of dealing with your residues other than baling it for animal feed or bedding. Unfortunately it is not a sustainable practice with huge amounts of carbon being lost in the form of CO2 during the tillage actions and with that the degradation due to a loss in soil structure. Removal of the stubble or residue for feed or bedding relates to a loss in nutrients from the system, resulting in increased fertiliser need during the next season. This process leaves the soil bare without any protection against the elements such as rain and wind, which leads to excessive loss of topsoil through erosion. Conservation agriculture has the opposite in mind, with the retention of residue on top of the soil to prevent erosion, forming a protective layer against the elements. It keeps the soil cooler in summer, which helps protect the important microbial life in the soil. The latter management practice does not prevent a farmer from having animals grazing on the residue during the summer season. At the Langgewens Research Farm of the Western Cape Department of Agriculture, near Moorreesburg in the Western Cape, four of the cropping systems tested include an animal factor which grazes on the pasture and wheat residue over the summer. The animals in these systems are managed in such a way as to ensure that no more than 50% of the residues are removed. In doing so you are able to retain enough cover on the soil. The advantages of the grazing is a quicker recycling of nutrients through the animal and less soil cover eases the planting of the next crop, especially when you are planting with a tine seeder. The animals’ hooves also help to break up the residue into smaller sections to ease the flow of the residue through a seeder. Although full cover is preferable it can make life difficult during the planting action. To help ease the problem, a farmer can drag some rubber tyres across the field to break stubble into manageable sections and to spread the residue evenly across the field. There are also rake-type implements available that can be used to spread the residue more evenly directly after harvest or before planting the next crop. The management of cover crops depends on what the farmer want to achieve. 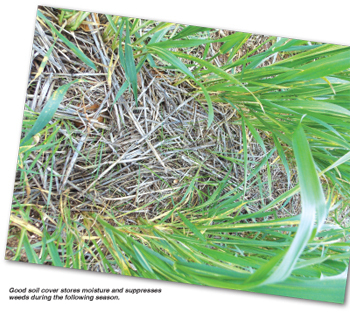 If you planted a winter cover crop, the management will be determined by what the use of the crop will be. It could be used as a hay or silage crop, soil cover or even for grazing. In all these cases the cover crop will help with weed control. It is important that it is planted early in the season to extend the growing season for as long as possible. The longer the growth period, the more material is produced. When the cover crop is used for hay or left for soil cover it is important to terminate the cover before viable seed is set. In the case of hay, the cover will be cut and left to dry before baling it or rolling it flat in the case of producing cover for the soil. In both these cases it can also be terminated with a registered herbicide. When used as silage, it will be cut at the time when the cover crop is at an optimum for making silage. If the cover crop is used for grazing, there are two options. The first is to let the cover crop grow for as long as possible before grazing it, which is probably the best option when grazed with cattle. The second option might be better when grazing with sheep or goats. In this option you have an early graze, after which the cover crop is left to regrow. The animals are then moved to permanent pasture until a possible second grazing later in the season (if there is enough regrowth). If the cover crop recovers well, instead of the second grazing, the cover could be terminated and used for hay. The most important thing to remember with a winter cover crop is to terminate it before a can set seed. A summer cover could be managed similarly if you are in a predominantly summer rainfall area. If you want to plant a summer cover in the winter rainfall area or a winter cover in the summer rainfall areas it would be wise to terminate the cover early enough to ensure enough time to accumulate water in the soil profile.